„This week Iran marks the 40th anniversary of the Islamic Revolution, and what a 40 years it’s been, tyrannizing its own people and terrorizing the world,“ Bolton said in an address posted on the White House’s Twitter account. 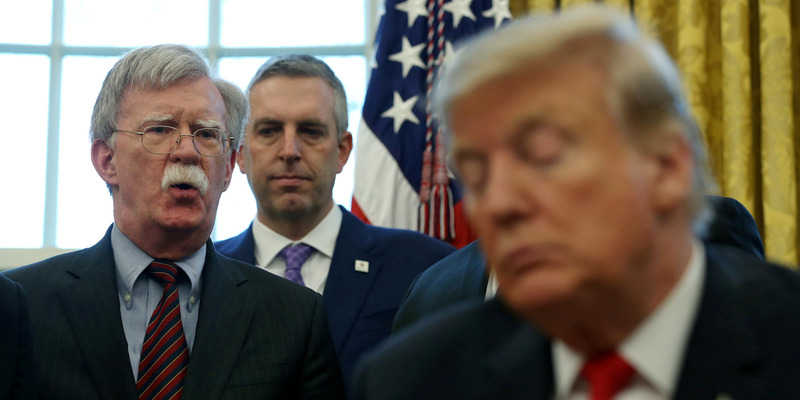 „Iran continues to seek nuclear weapons to intimidate peaceful people all around the globe and ballistic missiles to use as delivery systems,“ Bolton added. Coats‘ report, and his testimony before Congress about his findings, drew a swift response from Trump, who has long accused Iran of continuing work on nuclear weapons. After the scolding, Trump took a photo with Coats and other intelligence officials in the White House and blamed the media for distorting Coats‘ testimony. But as of Monday, the White House continues to say Iran is actively pursuing a nuclear weapon, contradicting Coats‘ report. Coats‘ report says „Iranian officials have publicly threatened to reverse some of Iran’s Joint Comprehensive Plan of Action (JCPOA) commitments—and resume nuclear activities that the JCPOA limits—if Iran does not gain the tangible trade and investment benefits it expected from the deal,“ but stops short of saying Iran is currently looking to build the bomb. Because Trump’s reimposition of sanctions on Iran has severely clipped the „tangible trade and investment benefits it expected from the deal,“ most experts agree the nuclear deal is in danger and Iran could quickly resume work on a nuclear bomb, but there’s little evidence today that it’s working on a nuclear weapon. „So Ayatollah Khamenei, for all your boasts, for all your threats to the life of the American president, you are responsible for terrorizing your own people and terrorizing the world as a whole,“ Bolton said, addressing Iran’s supreme leader. „I don’t think you’ll have many more anniversaries to enjoy,“ Bolton added.